Pierre Bonnard (1867-1947) was a major French Post-Impressionist painter and printmaker and a founding member of the avant-garde group known as Les Nabis, who were committed including symbols and spirituality in their work. In this piece, Bonnard depicts Montmartre, the hill in Paris that had long been a center of the artistic community. 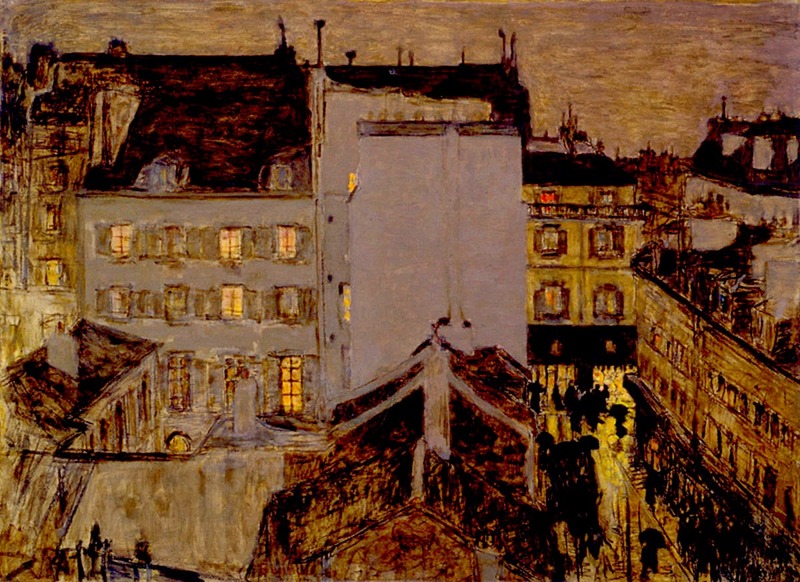 What particularly stands out in this work is the texture that Bonnard created; rain isn't explicitly discernible, but the viewer can feel its affects when looking at these buildings and rooftops. The brown palette seems to glow with warm light and we feel invited to take shelter in these homes with their yellow lit windows. Bonnard's painting conveys the romance of Montmartre, as well as a sense of community. His shapes are unusual and somewhat distorted but that only adds to the beauty, and perhaps slight mystery, of the scene. Very intriguing I am glad to see this artist again, and experience, in Montmartre in the Rain, the blend of Angelic gold with brown tones in a community that runs the gamut, connecting the human with the Divine that is within and around us.